Oh, my! This estate sale was more fun than when the circus comes to town. Actually, I’m not a fan of circuses, but you know what I mean. Being in that house was like stepping into a 1925 time capsule and bringing whatever I wanted back home to 2012! And I wanted a lot….. But for budgetary limitations, I’d have just bought the farm. The set has 4 matching napkins. Several of my friends wanted in on the fun, so we made it a girlfriend field trip. We caravaned into the quiet neighborhood, each shopper in her own vehicle, so that we had plenty of cargo space to carry home our booty. I had been to the house earlier in the week to help evaluate the textiles for my friend who was running the sale. I should have left a trail of bread crumbs. The old 1920’s neighborhood is a maze of angled roads with dead ends and roads just one block long, like the street where the sale was located. But I tried to take a short cut—big mistake— and instead spent nearly 15 minutes and probably a few gallons of gas snaking through the road maze. I am surprised that no resident called the sheriff to investigate suspicious activity. There we were, 6 giddy women in 6 cars in a congo line driving up one block and then another and then turning around—now that was fun on a narrow street with 6 cars! Periodically, I stopped and ran car to car offering apologies and encouragement to keep the faith. Finally we found the sale and got serious about our shopping. So here are some of my great finds. I love the cross stitch tablecloth and napkins in the photos above. The next time a sewing pal visits, I’ll set the table in the potting shed with this and we’ll have lunch. 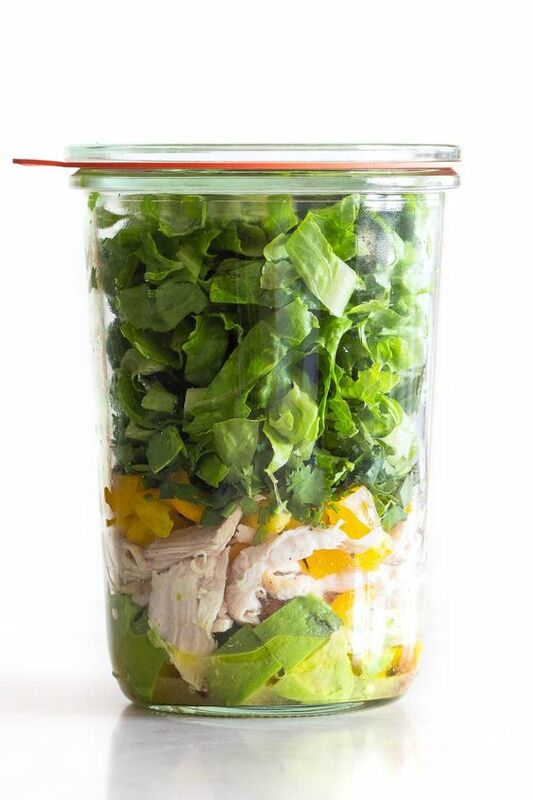 Won’t that be pretty? Note: call first for a reservation or we’ll be eating peanut butter and jelly sandwiches. This set is of a genre that I’ve seen frequently at other sales, but about which I know very little. 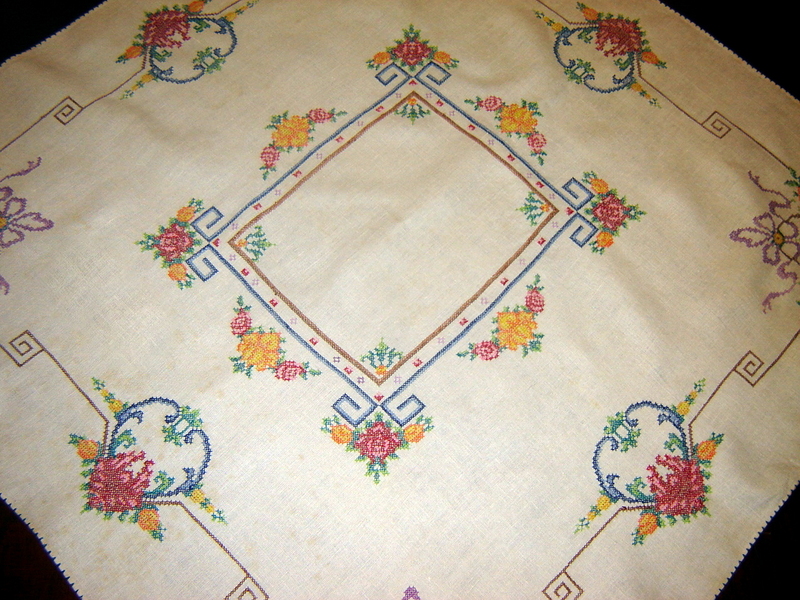 It is featured on the cover of a book on antique textiles, but the text makes no mention of the piece, the style, or the unique finish at the hem. Tablecloths, napkins, antimacassars, armchair covers, and more, are all done in the same rich color palette and always have the same hem finish. The hem finish is a sort of triangle, sometimes satin stitched and other times a simple short straight stitch. Most often, it is worked over a very narrow selvage and is quite secure. On shaped edges, like the curves on the chair set above, the raw edge is pressed up no more than 1/4″ and clipped, and finally stitched over the fold. It doesn’t hold up very well. Do you know anything about this kind of cross stitch ? 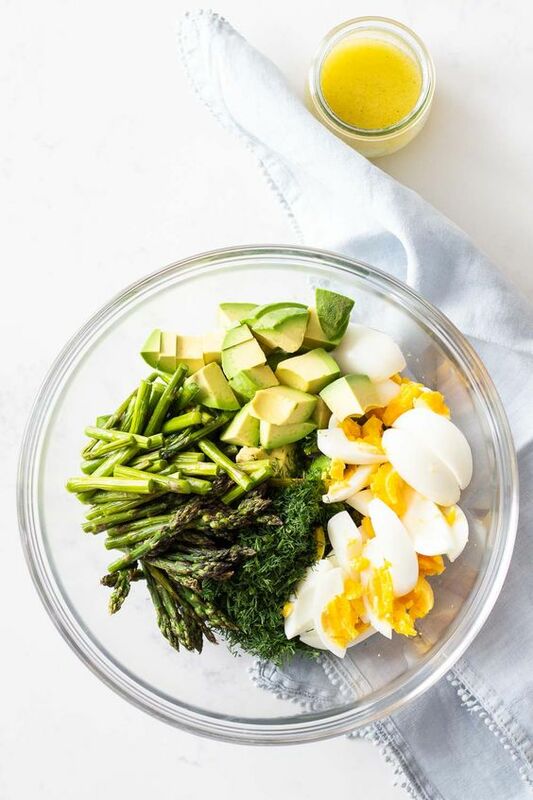 A name for the style? 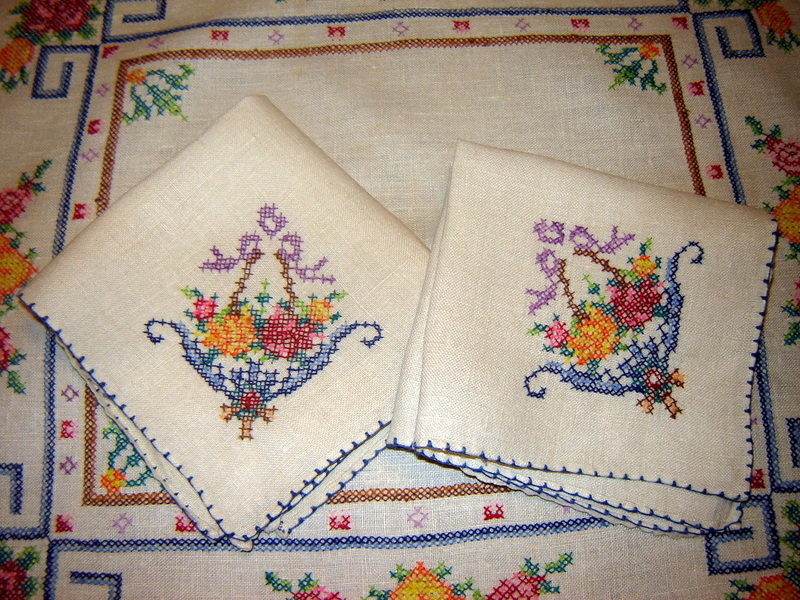 One site I found called it Arts and Crafts cross stitch and showed nearly identical pieces. This site also showed the back, which is another match for mine. 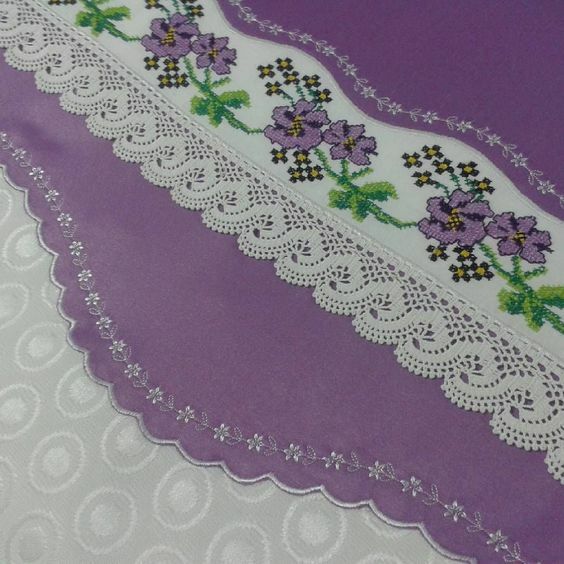 organdy table runner with handmade lace. Oops. 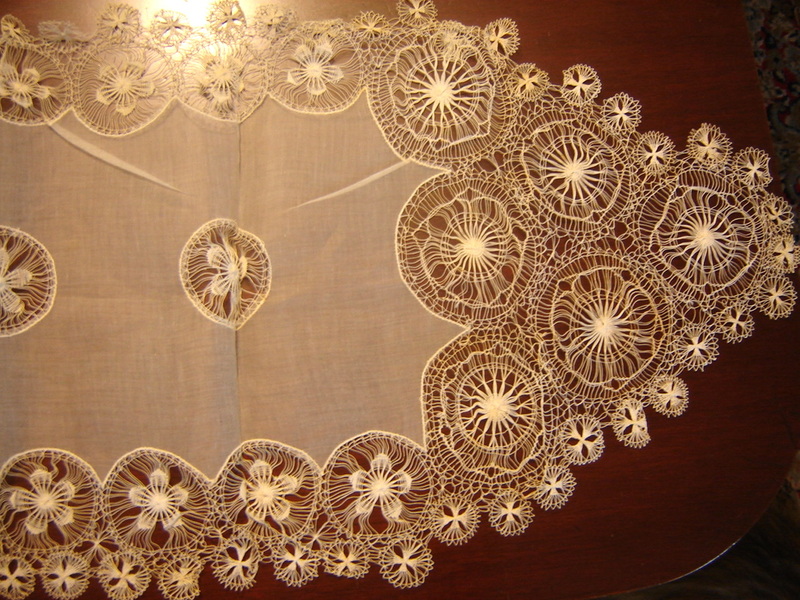 I just noticed that I did not gt all the little lace medallions facing up on the pointed end. 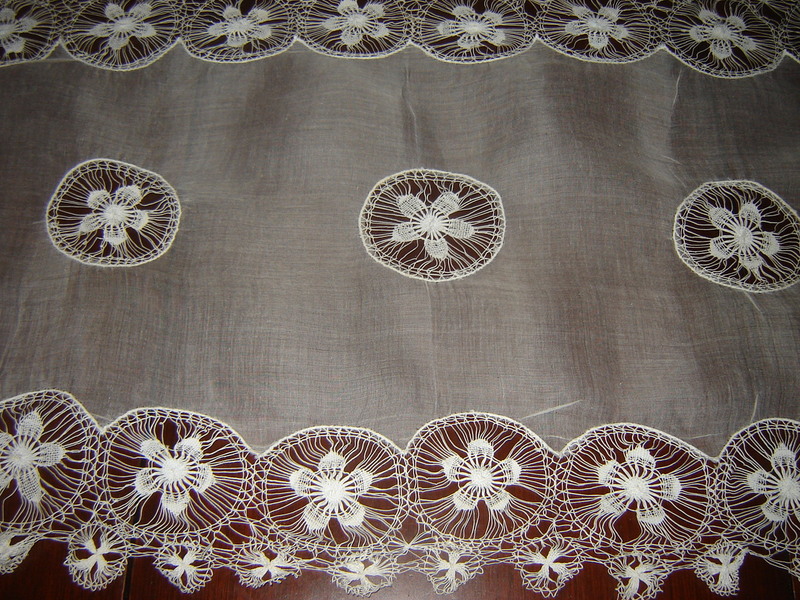 The organdy table runner or dresser scarf is spectacular. The lace looks like teneriffe but I’m not sure. But it most certainly is hand made. 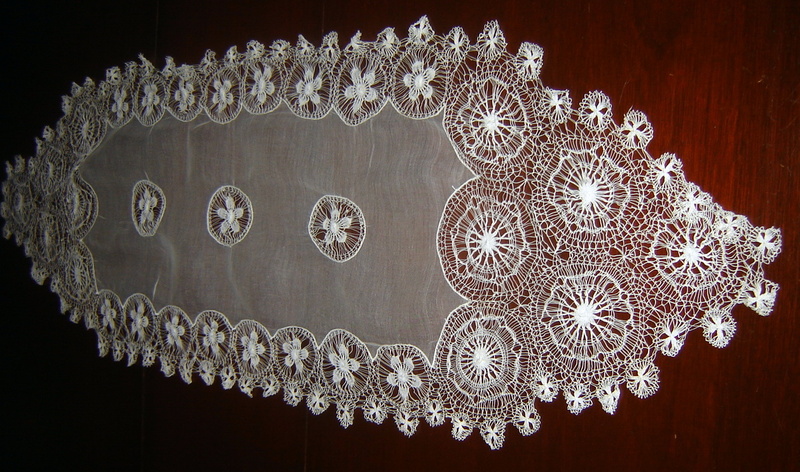 I wish I knew more about teneriffe and other antique textiles. I need to read up on the subject. The fabric and lace were both absolutely gold colored. It had been stored in a humid Florida attic for 30 years or more. It was so discolored that I wondered if there was any hope that it could be whitened. 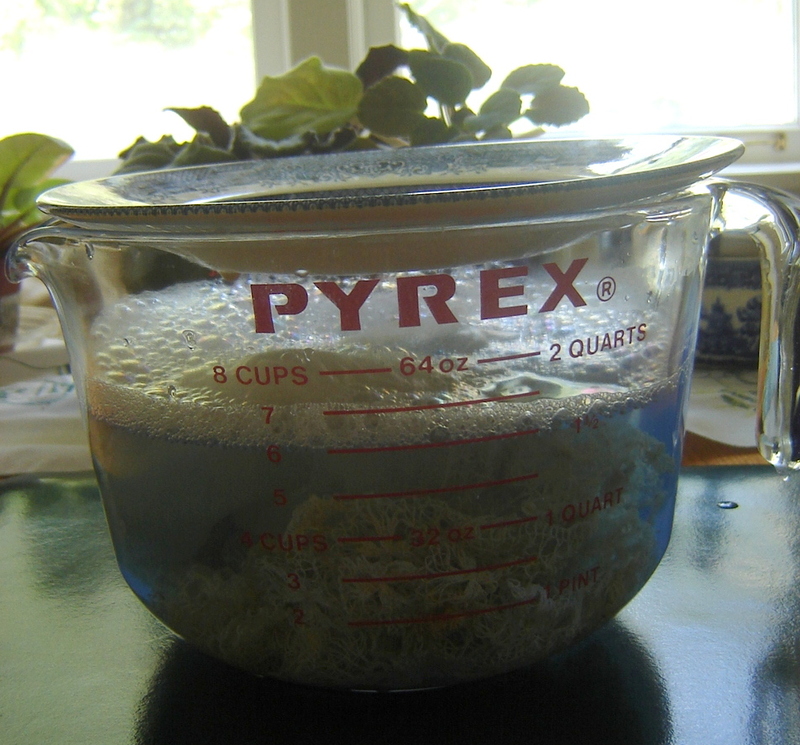 Thinking I had nothing to lose, I filled my old standby 2-quart Pyrex measuring cup with warm water and a hefty slug of Clorox 2. Notice the water is blue from the Clorox 2. Just 3 hours later, it had worked its magic. Notice how yellow the water is just 3 hours later. After soaking for another 24 hours and came much cleaner. It will find a home on the dresser in the guest room. 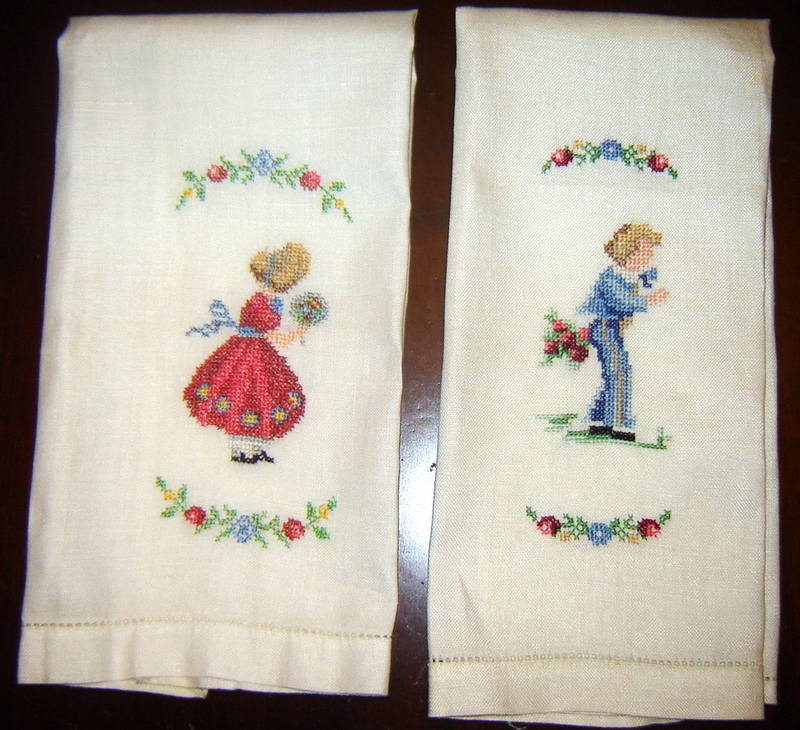 I just love these cross stitched boy/girl guest towels which look like updated versions of the famous paintings The Pink Lady by Sir Thomas Lawrence and The Blue Boy by Thomas Gainesborough. Robert and Laurel studied these paintings in our homeschool art class more than a year ago. It will be interesting to see if they recognize any similarities. The guest towels now hang in the upstairs bathroom which the grandchildren use for overnight stays. 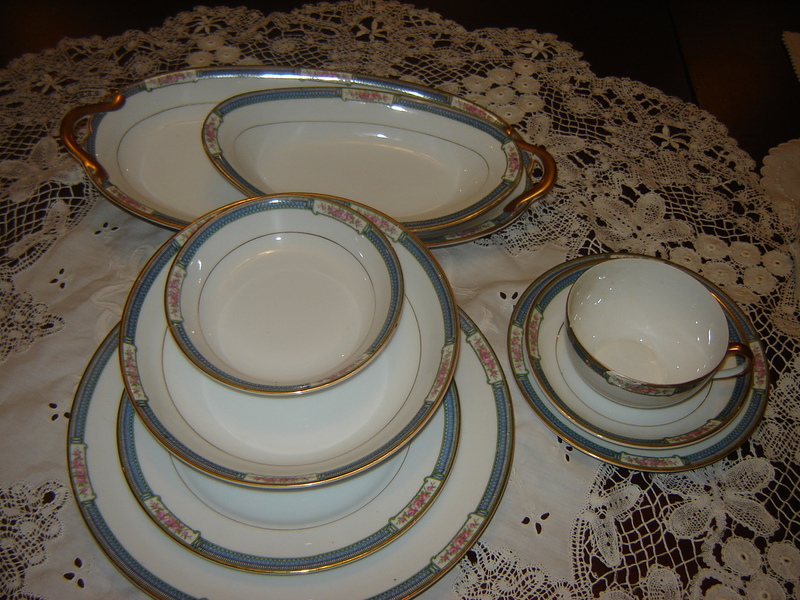 I had no will power at all when I saw this set of Noritake china. At this sale, there were no fewer than 4 complete sets of beautiful, fine china!!!! But this one stole my heart. It’s a service for 8 and has all the pieces shown plus a gravy boat. Aren’t they pretty? I also snatched up many of the items shown in the earlier post about this sale–the WWI Soldier’s Pay Record Book, WWII War Rations book, Lipstick linen towel and more. So what do you think? Didn’t I do well? What deee-vine finds have you picked up at estate or yard sales? 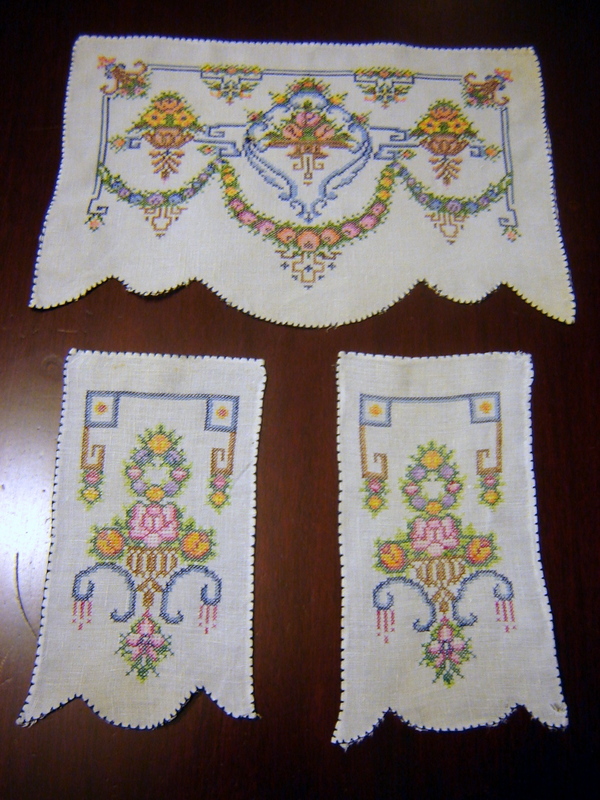 This entry was posted in antique textiles, antique/vintage textiles. Bookmark the permalink. I am catching up after being away for a week or so. You did so well at the estate sale. 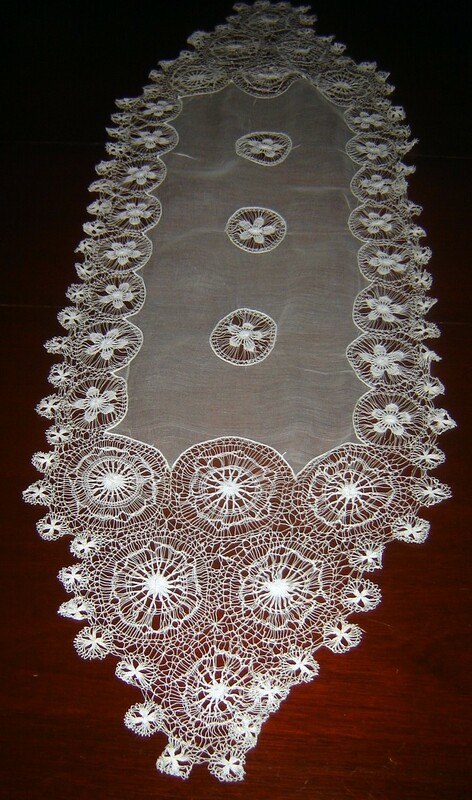 Love the lace runner or dresser scarf. I am a softy when it comes to the hand embroidered linen towels. I had the bronchitis, crud, or whatever it was about a month ago. I am STILL coughing a few times a day, especially if I am talking. Congratulations on the soon-to-be-grandchild. I know you are excited to have another reason to be stitching baby items. Thanks for the congratulations on the announcement of our next, and probably last, grandbaby. We are so excited. Gee, Beckie, it sounds like we share a lot of the same weaknesses—the lace runner, hand embroidered linen towels and bronchitis crud! I hope you shake all after effects soon. 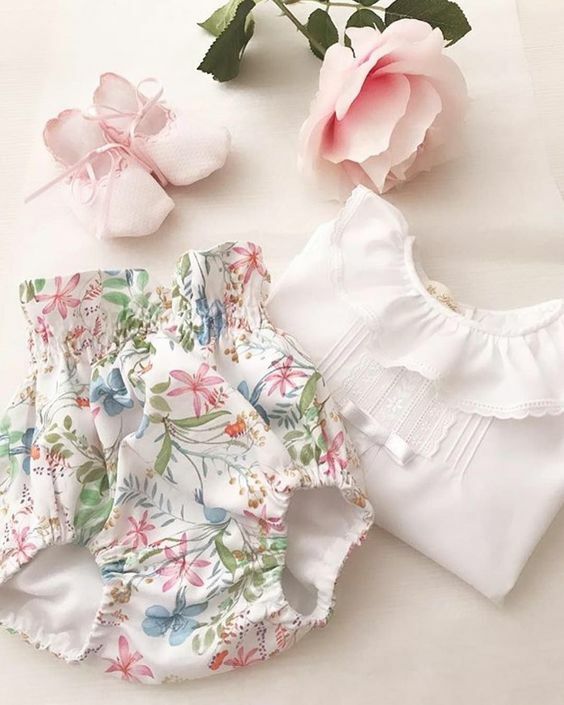 I have not been to an estate sale lately, but I was the recipient of a few very old baby garments when we recently disposed of things from my father in law’s house. I did wash the items but I think I will follow my friend Janice’s recommendation to soak these items in a “healthy dose” of Clorox 2. Nothing to lose. I think the table runner would be a perfect gift for you to give your very favorite(and only)aunt.Anyway,she IS your bff. 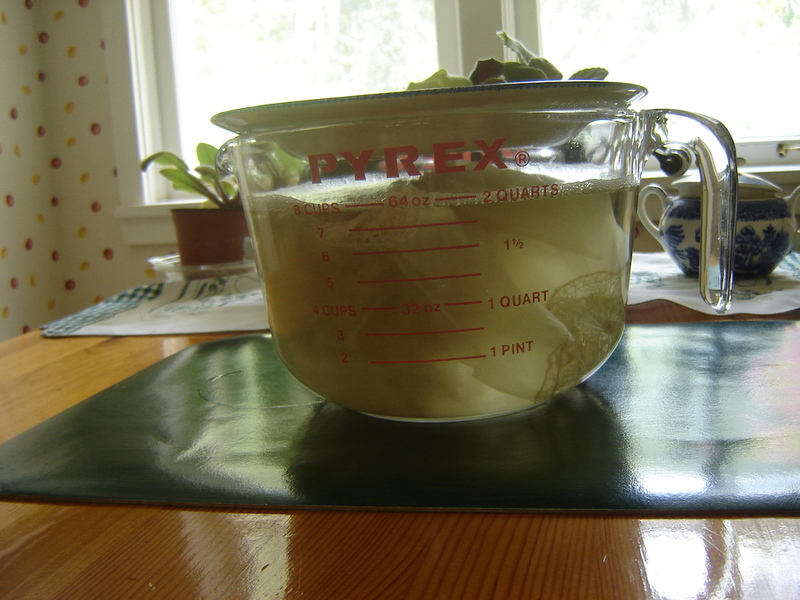 June, I have soaked delicate textiles for as much as 10 days. You just have to be careful handling them when they are wet as the extra weight of the water makes them even more likely to tear. I do hope yours come clean. As you said, you have nothing to lose. Hmmmmmm…I would think that my favorite and only aunt, AKA Senior Olympian Bronze Medalist Extraordinaire, would be more interested in a new warm up suit or athletic bag or a perhaps case of BenGay from her bff niece. Has The Jock Aunt morphed back into her old prissy self? Oh… I want to come to one of your estate sales! What a hoot we’d have! I also wish I could have come to at least one of Mimi’s schools, I always wanted to, but that’s why SATB started, for girls who couldn’t go away to Martha’s or Mimi’s. I love all your work and miss you… Have a great day! I wish all of my blogging friends could have come because there was just soooo much wonderful stuff to see, even if it wasn’t purchased. I’m still swooning over the textiles I got and will share more in later posts.